Scleral lenses are gas permeable contact lenses that can improve the vision and comfort for abnormal corneal conditions. Unlike regular gas permeable lenses , they are larger in diameter and rest directly on the sclera (the white part of the eye) versus the sensitive cornea. By vaulting the entire cornea, the lenses provide a smooth optical surface providing superior vision and decreasing glare, starbursts, and halos caused by irregular corneal conditions.These lenses require little movement and are filled with a fluid reservoir (non preserved saline) that hydrates the eye while the front optical surface corrects your vision. Keratoconus- this progressive eye disease causes the cornea to thin out and to bulge into a cone like shape. The irregular shape causes significant nearsightedness and irregular astigmatism. Scleral lenses can be customized to correct vision for these particular issues. Due to the size and vaulting of the lens, it doesn’t apply direct pressure to the eye’s cone shaped surface. Post Lasik- post Lasik contact lens fits can be notoriously hard due to the changes made to the corneal surface during surgery. 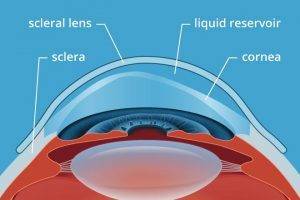 Scleral lenses sit almost entirely on the sclera, allowing the lens to overcome corneal surface abnormalities. Post RK- Radial Keratonomy patients experience a multitude of side effects as a result of the surgery, including glare and halos from corneal scarring. Scleral lenses provide long lasting comfort and sharper vision when properly fit to a post RK patient. Dry Eye Syndrome- decreased tear production causes a myriad of symptoms including poor quality of vision and decreased comfort especially while wearing contact lenses. Studies have shown that 85% of patients achieved relief of dry eye symptoms while wearing scleral lenses. The liquid reservoir holds tears between the lens and the eye minimizing redness and discomfort making the vision sharper and clearer. Dr. Bass specializes in difficult to fit contact lenses for impaired corneal conditions. Some corneal conditions are more advanced and are a more complex fit. However, Dr. Bass has the knowledge and skills to design and customize the scleral lens required. The entire fitting process often requires additional time to achieve the optimal lens for each eye. At Excel Vision we provide special scleral lens screenings to help determine if you might be a candidate. Call our office today at:602-404-2005 to speak with Dr. Bass and schedule your screening.